Anouk has been traveling in Zambia and Zimbabwe for the last several weeks, accompanied by veteran safari enthusiast Finn (her son). She managed to carve out a few free minutes – while sitting at the waterhole at camp – to send us some impressions of her travels thus far. So live from Hwange National Park, here’s Anouk …. Arrived safely at Camp Hwange after a long day of travel yesterday. 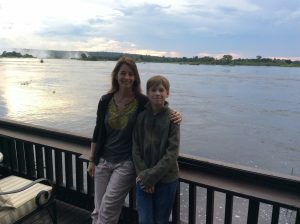 We had a wonderful stay at Victoria Falls River Lodge, which has an absolutely gorgeous setting, excellent game drives, and a lovely spa on the river banks too. Would highly recommend to everyone. We also really loved our stay at the Victoria Falls Safari Club. The Boma restaurant was festive as always, and we drummed along and even enjoyed trying the Mopane worms. One of the highlights was the vulture lunch, quite impressive and worth a quick look after lunch. Dozens of vultures come down for a feeding frenzy and it’s quite a sight! The objective is to attract the vultures so they stay protected in the National Park. In our three days at Victoria Falls, we also saw Victoria Falls Hotel, the Elephant Camp, Stanley and Livingstone and Ilala Lodge. All are looking spectacular with the fresh rains, the birds and gardens are gorgeous. We could recommend all of them for a lovely stay and of course one of the benefits of customize designing a safari is that we can pick and choose which hotel or lodge is best suited to your travel style and budget. For our daily adrenaline rush, we leaped off the Gorge, walked into the gorge, walked along the gorge, and zip lined across the gorge. It’s particularly beautiful right now with loads of spray as the Falls are really filling up after the recent (late) rains. In fact, so much so that many of the view points of the Falls are so misty that it is difficult to see the Falls, but fun to hear them roar and get a good soaking of course – but no worries, the water is warm and ponchos are easy to rent! 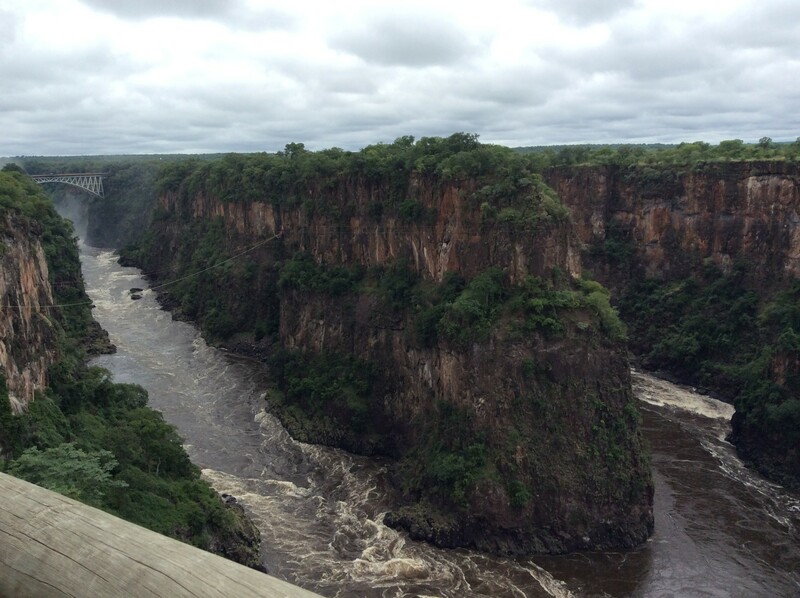 Before we got to Zimbabwe, we spent four nights on the Zambian side of the Falls, all long the river. We had a fabulous stay at Tongabezi, thoroughly enjoyed all the activities on offer including a visit to Livingstone to see the Museum, and into town where we also bought some crafts from the market. Bargaining skills are a must, but the sellers are very friendly and happy to make a deal. 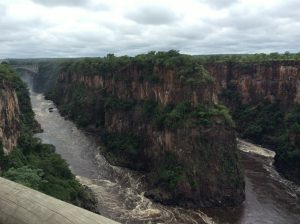 We toured the Falls with a guide from Tongabezi and got a complete soaking on the knife edge bridge, even with ponchos on! It was essential to bring a plastic bag for the camera. The Falls span the entire length of the gorge this time of year; it is so impressive. The following day we went to Livingstone Island where you can see the Falls from the top. The water is too high to jump into Devils Pool, but we got to sit at the top of the Falls in Angels Armchair, a thrilling experience to say the least. The water is nice and warm and the guides do a good job of encouraging you to ‘go for it’ while making you feel safe. We spent a night at the Victoria Falls River Club and had a wonderful sunset cruise where we spotted two lions on the river banks among many other animals. We followed with a night at the Royal Livingstone, a perfect spot if you only have a night or two, as it’s an ea sy walk to the Falls from there. We had a lovely hike down to the Boiling Point on our next visit, with a fairly steep walk back out, but worth it after all the food we have been consuming. 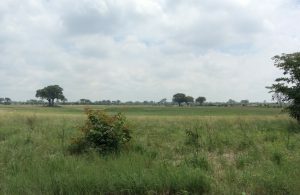 We are now enjoying Hwange Game Park, staying at Camp Hwange where both game drives and walks are the order of the day. The green season has brought out the most beautiful hibiscus blooms and the birds are stunning. We are sitting here watching a beautiful pair of crested cranes, an elephant bull and about twenty other bird species that our guides could easily identify, but we are just too content and relaxed to take notes! Tomorrow we move on the The Hide and Somalisa Camp, so will fill you in on that experience when we return! ← This was truly a trip of a lifetime …..